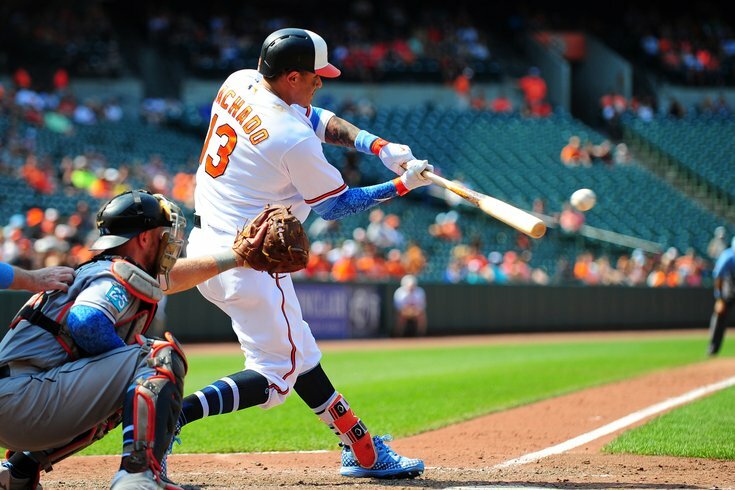 There was already ample buzz that Orioles star infielder Manny Machado could be in red pinstripes by the July 31 trade deadline, but the musings are seeming more and more likely to actually pan out after recent events. The Phillies are hanging in there as they look to make a surprise run at a playoff spot. They've won four of their last five after taking a series against the Cardinals this week and seven of their last 10. And, heading into a weekend series in Washington, the Phillies are currently tied with the Nationals for the second NL wild card spot. In what looks to be a loaded NL East, the Phillies are proving the doubters they belong near the top of the standings at six games above .500. So there is incentive for the Phils to be aggressive on the trade market. Where might they focus their attention? Well J.P. Crawford is set to miss 4-6 weeks now after fracturing his hand. The Phils offense somehow is doing more with less, as the team's meager .233 batting average slots in as the fifth worst in all of baseball. They need a bat — and now they need one who can play shortstop and third base. Enter Machado. The Baltimore third baseman has the defense, but more importantly has a heavy bat. He is hitting .310 this season with 18 homers and 53 RBI. Machado would lead the Phillies in all three categories were he to join the squad. Recently, MLB insiders Jon Heyman and Bob Nightengale each pondered what a Machado trade to Philly would look like — the result of these brainstorms appeared to be shortstop prospect Arquimedes Gamboa and pitching prospects Enyel De Los Santos and Jose Taveras. Never heard of those guys? Exactly. If the Phils can land the slugger for middle-of-the-road prospects, it would be quite the get. One of the reasons his price is low is that he will be a free agent this coming season — so the Phils may insist he sign some kind of extension upon coming here. But with the O's 28.5 games behind in an even more loaded AL East, Machado may want to stay in an up-and-coming franchise that can compete. Another big name infield bat is also linked to the Phillies in the wake of Crawford's injury: the timeless 39-year-old Adrian Beltre. If the Phillies continue to stay in the mix for a playoff spot, boasting rather impressive pitching and timely hitting, you can bet they'll take a stab at a bat to help them compete down the stretch and beyond. And hey, you never know. Adding Machado this summer could help persuade Bryce Harper to move to Philadelphia this winter.